Roaster in excellent condition. About six years old. Roasts beautifully. This model has the upgraded 2K control panel and thermocouple sensor. Genuine Australian 240V version (Beware of 220V versions in Australia as they can over-heat). Two new filters included. Local pick-up from Beaumaris, Victoria or buyer to pay for shipping in addition. Packed weight is about 9kg. Price is $900. Last edited by mikef; 5th November 2018 at 04:51 PM. Hi what is the batch capacity of this roaster please? ok thanks I have been trying to decide between the behmor and something like the hottop or gene. I think more research is required. I had both and I would take the hottop first, it is easier, at least for me it was in that way. Yes I did buy it in 2008 but had it packed away for 4 years while I was overseas. So only six years of light use. I also upgraded the panel and thermocouple to the 2K version. Huge improvement in temperature control and accuracy. Was it bought in Taiwan? Yes. I had it imported from Taiwan. 240V Australian version. The K2 upgrade (which I did about three years ago) cost $360. I noticed that the other Hottops being sold are virtually all the 8828B models; not the 8828B-2K models. I'd be happy with $750 with local pick-up. I'm happy to ship it too. Shipping would be $40 extra. Let me know. Someone should get this roaster, great price. I have one the same age with the K2 upgrade, very easy to roast with. Roasting 300gm most of the time. I have never had a bad roast out of mine! By the way, you have not said why you are selling? I bought the North TJ-067 1 kg roaster a few weeks ago. Busy repairing it and setting it up. 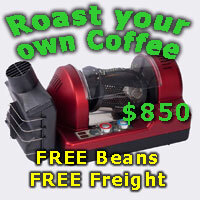 I'm interested in buying this roaster and I've sent you a PM.